Help Documents - Version 5 Emails: Contact Lists, Invitations, RemindersWhat do I do if I'm on a Black List? What does a black listed error message look like? 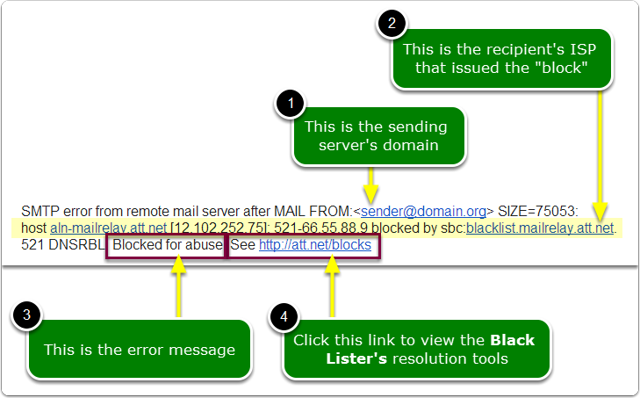 All recipient email servers process Black Listed domains differently. Some messages are highly cryptic and some are easy to read. There are no standards; expect anything. If the ISP has a resolution (how to get off their black list), they will provide a link to the instructions for removal - some ISPs do not include a resolution link, such as Gmail. With Gmail, you can only wait until they decide to clear it - they offer no resolution except the tincture of time. Not all ISPs provide resolution tools. The SPF Record attached to the sending domain (example: YourCompanyDomain.com) blocks rsvpBOOK.com from sending email that "claims" to be from YourCompanyDomain.com - See this help document: What do I do if I have an SPF issue? Next: What do I do if I have an SPF issue?